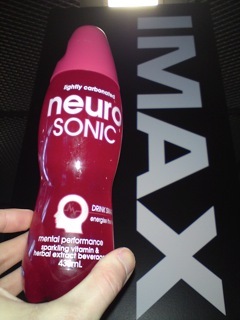 "stay energised, focused and alert with modern science's greatest blend of natural mental performance enhancers"
While weaker than the mana & health potions I'd reviewed before this sounded like something that I could enjoy with a big visceral movie. The taste is similar to the bliss drink, but I'd say a little closer to normal energy drinks. It's quite a mild flavour, almost watery, but there are loads of interesting and unidentifiable aftertastes that float around. It definite started to kick in around the half-hour mark and once the big battles and flying scenes were underway I was experiencing a higher level of alertness and a little bit of twitchiness too. The drink does have a lot of caffeine in so this probably explains the majority of this. I think that this would help with late night work sessions, especially when motivation is low, but I'm guessing while alertness is good concentration is also necessary. Due to a housemate returning in the very early hours of the morning I was woken at about 3 and didn't get back to proper sleep for hours. Even then my sleep and half-awakeness was filled with odd visions and strange dreams as if my body was quite tired but my brain was up and eager to play. As I drank this between 4-6pm and had a large Chinese meal afterwards I hadn't expected it to have lasted that long. Maybe it reacted with the additives in the food.